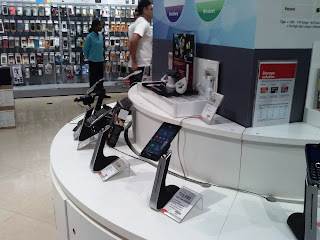 Kind of shopaholic I am, this IndiStuff gave me another chance to spend some time roaming and then blogging about. 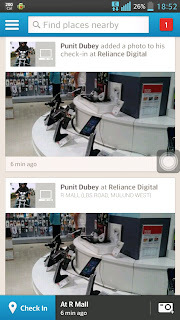 This time the task was to visit a Reliance Digital Store of our choice - view it and then review it. I chose the one at Mulund, reason simply it’s the closest (except the Vashi one – which wasn’t on the list) from my place. Reception: Received with a very amiable Namaskar by a staff in light blue at main gate. This store is very aptly located quite in the mid of the town at one of the most famous malls of suburbs. 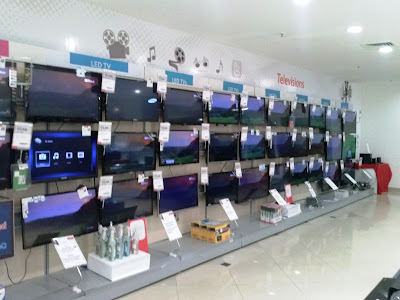 So, must say it is well connected with the customers it strives for. As I told we were very warmly received at the Gate. Staff weren’t that aware about the Bloggers’ visit to the place (in fact, one even tried to learn why so many ‘Indibloggers’ were there). 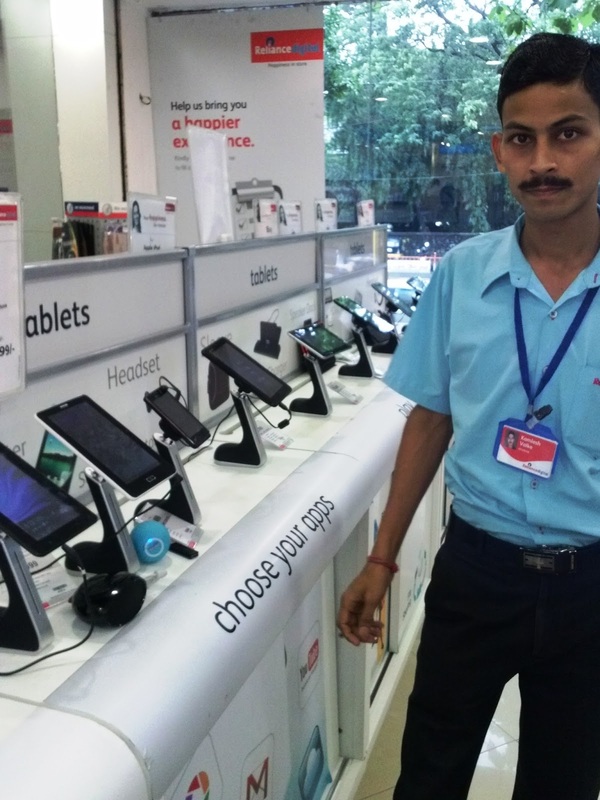 Roaming around to meet the Manager to report him, we met Nidhi, who again received us warmly asking our details, striking off our names from her list, and then taking our feedback on her blackberry – all with a smile. We requested her to be left alone roaming around the store and taking snaps. 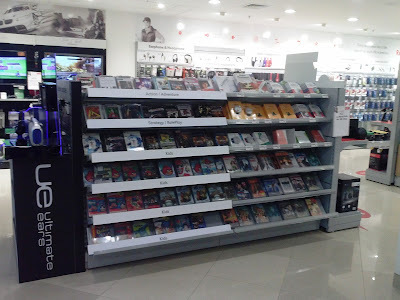 The store is more or less like the other Branded electronic stores I have been to, including Reliance Digital and others too. But yes, staff density is relatively higher. There were different sections dedicated to Memory cards, Mobile Cases to Mobiles, portable speakers to home theatre systems, LCD to Smart TVs, P&S to DSLRs, and then a large section dealing with home appliances. 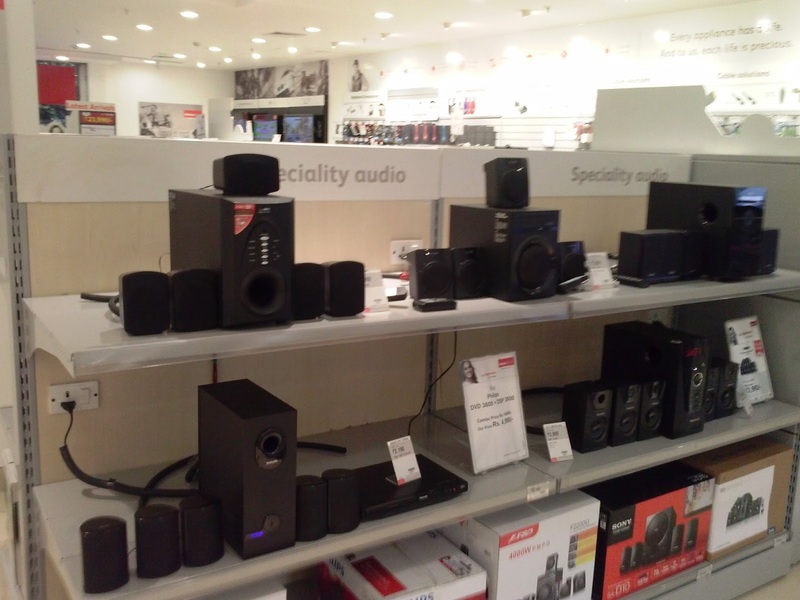 What I really loved was a room dedicated for Home Theatre System. I had a Reliance Gift Card that I wanted to encash on this auspicious day (actually I hate window-shopping, so this card gave me a reason to visit the store). My first choice was a 32GB MicroSD Class 10 card, but I didn’t find the price I was looking for. So, I thought to check out some portable speakers. Choices were Sony, iBall and ReConnect-a home brew brand. The first guy we met wasn’t that comfortable with stuff, but then came another guy Kamlesh – a speaker guru. 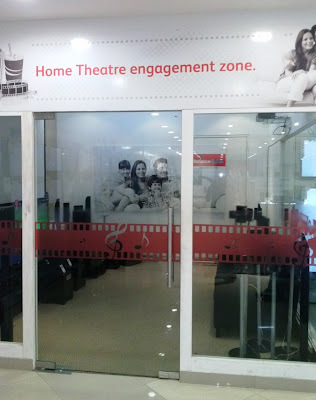 He gave us detailed demo of all the choices and also introduced us to that Home Theatre Engagement Zone. Finally for the price and features I zeroed upon the ReConnect Bluetooth Receiver. Not much crowd, we went through a hassle free transaction at Counter with payment in parts by Gift and Credit cards. 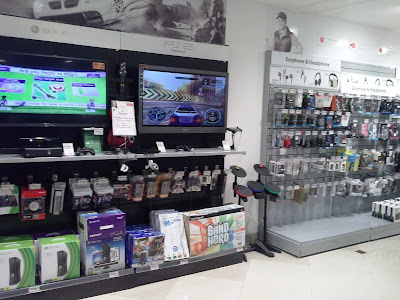 Some more time, devouring 3D Smart TVs, Games corner and we planned to leave the store. As told earlier, we searched for Nidhi but she had already left. Another lady at Customer Relations enquired about our experience and we called it a day. 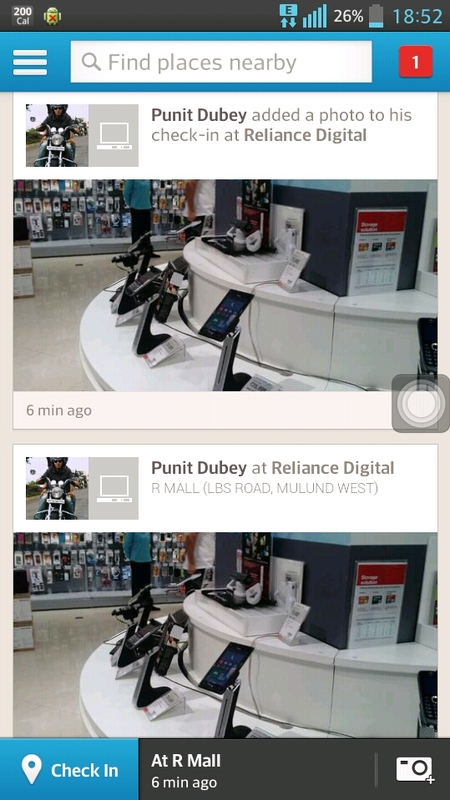 A shot of the Mobile/Tab section..
Reliance Digital has got a semi-active online front also at http://www.reliancedigital.in. Stuffs are listed there with prices but aren't yet available to shop online. Concluding, I liked the store. Pricing is competitive, staff friendly and generally knowledgeable, ambiance pretty, options not that high but well over to be called as moderate. Staff wasn’t prepared about Bloggers, though they should have been told – but I guess it’s good to act like a customer to them rather a Critic blogger; that gives a rather good opportunity to evaluate something/someone. At least that way we know they are not acting friendly. Also the other side of coin is that the ignorance somewhere shows that they weren’t well prepared for this Event as such, missing the promised GoodieBag (much criticized on most of the blogs) is one such thing to take the clue. I wrote this post for Indiblogger-Reliance Digital Experience Event. 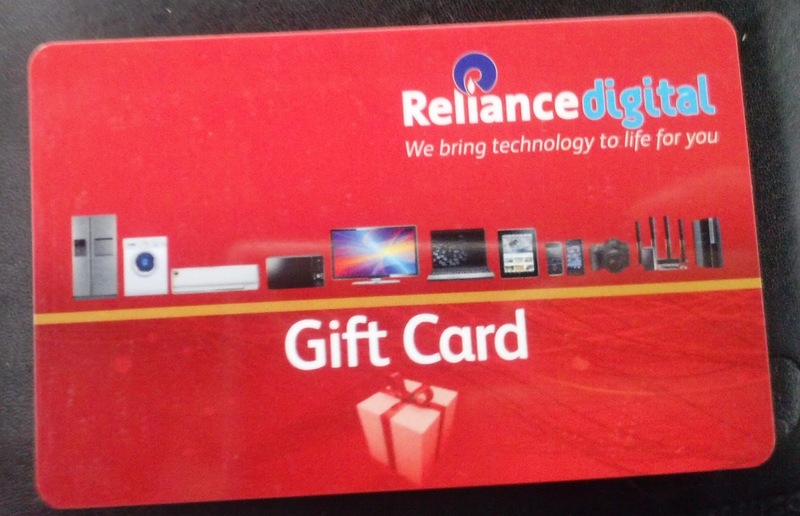 I feel I should declare this BIG DISCLAIMER that I work for Reliance Industries as a Geologist, and though we (Petroleum guys) are no way related to Reliance Digital (Retail guys), we share same huge IT Park, work in different buildings and sometimes play football together at Father Agnel’s ground. Views that I expressed above may look biased now, but are Honest and un-influenced. By the way, I sometimes feel I am paid by Indiblogger for blogging (at least for not procrastinating).